"So glad that I found you in a Google search! Your website is as easy to navigate as Amazon.com! Good for you!" Deception, greed, and a deadly lust for power lie at the heart of a sinister organization in this intriguing thriller based on the novel by best-selling author Robert Whitlow. 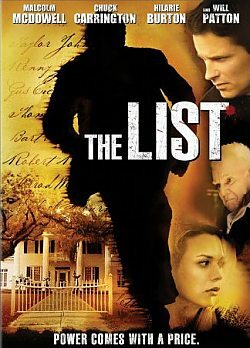 Starring Malcolm McDowell (TV's War And Peace), Chuck Carrington (TV's JAG), Hilarie Burton (TV's One Tree Hill) and Will Patton (A Mighty Heart), The List is a heart-racing tale of suspense and betrayal, in a dark world of blood oaths that bind generations. Returning home for his father's funeral, Renny Jacobson (Carrington) discovers he's the inheritor of his family's chair in a secret society founded during the Civil War. But Renny suspects there's more to the society's activities than meets the eye, and when his inquiries into the group's true nature are discovered by its corrupt leader (McDowell), Renny becomes the target of a dark and mysterious force with the power to destroy everything - and everyone - he loves. Read our exclusive interview with female lead Hilarie Burton. Format: DVD Region 1 Widescreen What's a Region Code? For many people, the holidays are the loneliest time of year. Great story, great author!! He has written some awesome books. This video is set in the Charleston, SC area where you can just imagine this happening. I read the book first and eagerly awaited the video. I did watch the video the second time to understand how they were protraying the caretaker and landlady. This book is a great mystery-adventure story that would be on an adult interest level. Get it and be ready for a mystery-interesting adventure.